I hear a lot of complaints about the rainy season, but I kind of like it. The streets are a little bit quieter during neighborhood walks, and it’s a good time to be reflective and think about the pretty, warm days to come. 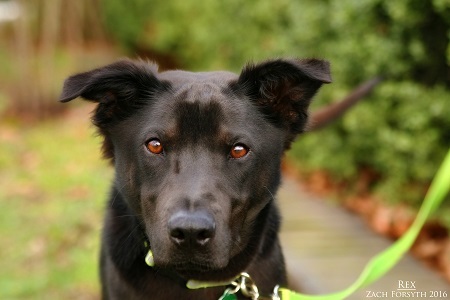 My name is Rex, and I am a thoughtful and intelligent 40 lb Lab mix with a gentle soul. New experiences make me a bit nervous at first – you could say I’m an introvert – and I will need a patient family who will give me plenty of treats and TLC. I’m a youngster at only 1 year old, so I need puppy classes to further my socialization and education – I’m hoping to be a philosopher one day! I’m a bit scared of other dogs and cats, so one on one meets are best for me (no dogs parks please)! Since I do need so much training, I’ll be best in a family with older kids so I can get the focus that I need. Are you willing to give a boy like me a try? I promise to be your devoted, loving sweetheart! Fill out the adoption application so we can schedule a meet and greet. I am fixed, vaccinated, and microchipped. My adoption fee is $250.